In a recently settled motor vehicle accident claim, Mr. Simpson (not his real name), was walking to his local supermarket to buy his weekly groceries. During his trip to the shops he was hit by a car that was leaving a car pack. Mr. Simpson was walking on a foot path that crossed the car park driveway. He suffered minor injuries and since the motor vehicle accident he has required ongoing physiotherapy and support from family and friends to do certain life tasks, such as buying groceries or driving. At first, the insurer of the driver accused Mr. Simpson of being partially at fault and that he stepped in front of the moving vehicle, therefore contributing to the accident. Mr. Simpson’s solicitor was able to prove that under the Transport Operations Regulation that a driver must always give way to a pedestrian in a shared zone such as the footpath across the opening of a car park. The solicitor was able to secure enough settlement so that Mr Simpson can continue to receive physiotherapy and pay a carer if his injuries do not improve. Move off the road. If possible, move out of the way of other traffic to avoid further accidents. Assess your injuries. If life threatening or urgent, call an ambulance. Collect details. This includes the driver’s name, address, car registration and insurance provider. The contact details of any witnesses of the accident. Report it to police. If police were not at the scene you must visit your local police station to report the accident. &Seek medical attention. Visit a medical practitioner to officially assess your injuries. Request a medical certificate, different to doctor’s certificate. Make sure you tell the medical practitioner about all the injuries you have sustained. 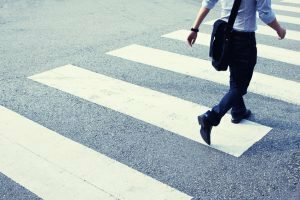 If you’re involved in a motor vehicle accident as a pedestrian these are the vital steps you need to take to insure your compensation moves forward smoothly. Written by Shine Lawyers on July 23, 2017. Last modified: September 26, 2018.